Adam Rothstein | Thu Sep 13th, 2012 9:20 a.m.
A certain thread of theology holds that angels are not actual entities; they are human characterizations of god’s infinite will, manifested in singular points of time and space that we can only represent as corporeal actions by supernatural beings. Drones are the same. The Unmanned Aerial Vehicles themselves are made of very real alloys and composites, flown with very real bands of electromagnetic energy emitted from satellite and ground station, launching weapons with exothermic warheads resulting in very real deaths. 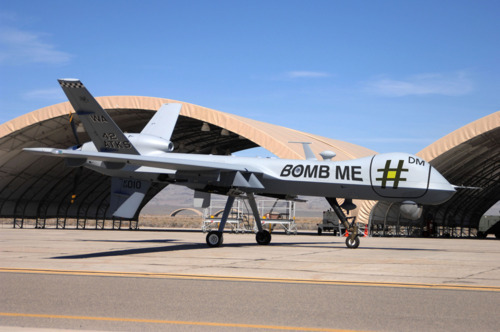 But “Drones”, as we have come to know them, represent an intensely collapsed political, economic, and social cosmology. They are singular points of world-historical militarism, state control, and technological specialty, orbiting high above our heads, the new astrological wanderers of our mortal fates. Dare we ask the rhetorical question: how many drones can surveil the head of a pin? 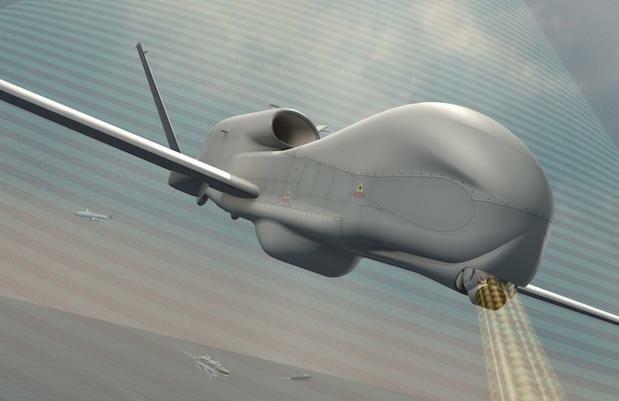 MQ-1 Predator, MQ-4 Global Hawk, MQ-9 Reaper, RQ-170 Sentinel: these names are the basis of a new hierarchical choir of angels, as cataloged by Jane’s All the World’s Aircraft. Drones function in our current Future-Present, as a category conglomerated from many components. A MQ-4 has very little to do, technologically, with a smartphone-controlled quadrocopter. The relationship between them, which we fetishize into the category of “drone”, is a composite of factors and values so intricate as to border on the cosmological. It is true that they both fly, with different types of remote control. They both contain cameras, so that a person can see a visual field from the vehicle’s perspective. They both contain technological advances that are not entirely new innovations, though their widespread use and public recognition is a relatively recent event. And yet, one is an expensive toy, while the other changes the geopolitical landscape as a weapon of war. It is only when their use, political significance, and market value are networked to their technological construction that they become equivalent in the Future-Present cosmology. If angels are too metaphysical a means of getting at the cultural function of such a unifying concept, let us utilize a more atheistic church, another sort of holy ghost. Drones are technology, commodified. Commodities are objects, abstracted from their strict material origins, and invested with a surplus of market-meaning. An automobile, for example, is not so much the frame riding on four wheels; it is not pivotal object of the American Dream; it is more than a single class of “Sport Utility” use-case or a particular brand name. It is all of these things. It is a history of technological advancement, a society’s main means of transportation, and a set of cultural value signifiers, condensed into a single object. What does precision milling equipment have to do with “Tell Laura I Love Her?” Everything and nothing. Technological commodities exists in multiple dimensions of technology, culture, economics, and politics simultaneously. What we perceive is the object, but behind it, is its cosmological network. We watch a video of a drone swarm in a college laboratory. We hear a news report about a drone strike on the other side of the world. We dream about the future of airspace regulation over drone-like inventions that don’t exist yet. We interact with all of these threads when we think, talk, or work with drones. But what is important to remember about all commodities is that just like this particular archetype of the Future-Present, their existence is not spontaneous. The abstraction of drones’ technological reality into a dreamscape of Future-Present speculation may give us a dozen Minority Report’s worth of murmurrating clouds of flying vehicles. But it does not spring into existence from a vacuum. Drones, as commodities, are “sold” to us, whether by Northrop-Grumman, the State Department, toy companies, Hollywood, Al Qaeda, or Occupy protesters. We adopt this theory-object as a means for thinking about the technological, political, and social issues trailing off from the node that is “drones”, and our use of it feeds back into its continued production. Don’t let the terminology fool you: this is not simply a criticism of the capitalist systems that work to engender the Future-Present for us, any more than it is a theological criticism. This is part of being a responsible consumer, and even more so, a human being engaged in our history. Even if we are not buying the Future-Present in the form of a smart phone, we are still subscribing to it as part of the constant process of design fiction we engage in, as members of a historical society. We don’t need to invest in drones. In contemporary times, they are buying into us. As we are already ceaselessly engaging with the built-up commodities of the Future-Present, my informants noted, we must understand them better. The curve of adoption is an emotional curve. The myth of the rational actor--that people will ultimately make rational decisions--is responsible for much of the damage of the 20th century. People think that they use rationality, and that’s the fundamental lie of western culture. We’re really bad at making reasoned decisions. Look at all the logical fallacies that exist in the world. We have many kinds of intuition, which are often useful, but also sometimes really bad. This isn’t to say we can’t think rationally, but your reaction to a shiny gadget is not necessarily rational. Do you want a smartphone in your life? Do you want to buy into that culture? There are people who ask these rational questions, but they are statistically insignificant. The Amish excise that choice from the individuals and give it to a community that follows a protocol. Most of our interactions with technology are doing what people around us do. The curve of adoption— one of the many factors that make up the commodification of the Future-Present--is indeed a form of group-think. There is no rational actor, or invisible hand. There is a cultural unconscious, and its choices are not as simple as a Pepsi Challenge, but more like facial recognition software. What elements of the Future-Present we tend to recognize and select are based on a protocol formed from multiple steps of pattern recognition and summation. The distributed network of decision making is almost an algorithm. But while this cultural “computer vision” might be obscured from our rational minds, we can still hack into that algorithm and evolve it, if we know what we are doing. There are two particular aspects of the cultural weight of technology that are interesting: first, there are technologies that either are or aren’t culturally absorbed. Often a technology will disappear, or isn’t accepted culturally. For instance, game systems that are put out onto the market and fall flat, or Blackberrys that are put out on the market and aren’t used. But then there’s the iPhone, which is changing the way people think and interact with cities. Second, there are things that don’t need to be absorbed--surgical methods, geotextiles, city infrastructure. These things are going to be used because of their function. But the other stuff needs to be coaxed into culture. Medical technology moves forward whether or not it is culturally accepted. And yet there are so many new kinds of back surgery that because of their cultural appeal, seem not as invasive. They’re marketed in an effective way. It’s almost an app-ification of surgery. There are things like proactive prosthetics, cosmetic prosthetics, better designed limbs. When it comes to paving freeways, on the other hand, it doesn’t matter if people think it’s cool. It’s all about the companies and the contracts involved. The question becomes about the technology: is it consumer-based, or infrastructural-based? An elevator gets installed without much input, but smart elevators do have interfaces. People wait for elevators, and interact with them that way. Is it a price point, or the novelty of being able to actually do some of these things that brings it from an infrastructural technology to a consumer-based technology? It’s hard to know where or when things will take off, and bloggers around the world will start writing about it. It’s difficult to predict. People said that cell phones would ruin Apple, but the iPhone has changed the way we think about phones. The sort of speculative blogging that I and other bloggers do, does this actually have a reach and affect on market forces? I don’t have the evidence either way. I think the genre of the review, ironically, has more of an effect that listening to me, Matt Jones, Julian Bleeker, or some sort of design-fiction piece about the cameras of the future. I like these, but I don’t know if they are actors on the world-historical stage. “iPads and the geological formations of the moons of Saturn”--I might write that, but I don’t know that it would change the development of the iPad. When looking at the Future-Present as commodity, there is always a tendency to label so-called “market forces” as the primary force upon the development curve, and the key variable in that cultural algorithm. So much of our technological development is spurred by the pursuit of profit, that it is easy to say simply that this is what commodities are “for”. But what Geoff leads me to ask, is what factors exceed simple supply and demand? Speculative fiction hardly creates demand all on its own. But decisions are not purely the result of focus-group calculus, either. What single demand engendered our concept of drones? While certainly there is money to be made from drones, larger societal desires than profit factor into our fascinations and fears about UAVs. I'm actually rather more concerned about theory objects that develop into things that aren't "commodified." We've got legions of commodifying guys already. They get up every day doing nothing but trying to make ideas into commercial products. There seem to be some remarkable spaces opening up for products outside the conventional markets. A good thing, too, because those markets are sclerotic with IP and are stifling us. The speculative fiction creators that may or may not affect the shape of the market have their exo-market allies in the odd use-case scenarios that develop as street-level innovations. Hackers, and others who explore the margins of commodities’ uses are their own formative effect on both Future-Present and its commodified incarnations. Outside of capital exists an entire world of use, shaping how we know and think about objects. It’s common in India to communicate by phone rings, without letting the phone connect, so they can convey information without being charged for the call. This is not about the fact that there isn’t technology available to allow people to make phone calls. It’s about finding a way around the monetization structure. This is a marginal case, but it’s a useful way of thinking about hacking the system. Richard Nash writes about “monetizing the entire demand curve”. Amanda Palmer-- she has a very developed fan base. If you look at the Kickstarter tiers, it starts at a dollar, and the tiers go up and up. The house parties on Palmer’s Kickstarter campaign were in the $10K range. Everyone should be able to get something they want at the price they can afford, otherwise you’re leaving money on the table. Back in the old days, the best you could do is buy a band’s CD for $20. If you had less money, you were out of luck. If you had more…well, you could fly to another city to see them, but the band itself wouldn’t profit from the extra money you were spending. Now you can have a range of experiences. The thing about the phoning and hanging up.... if you’re a company, you can decide if you want to monetize the price points, but at some point you decide it’s not worth it. Even if the customer is not connecting the calls, they are still paying money to have a phone. The use-cases of technology always overwhelm the ability of the market to monetize it. Commodities, therefore, are never just about just capitalist commodification. And because there is a curve of emergent behavior to factor into the construction of a commodity, it means that the Future-Present, as commodity, are evolving nodes, to which there are fundamentally no limit of variety and number. Who affects drone development most? Those who build them, those who buy them, those who fly them, or those who are watched by them? There will always be emergent behaviors like these, especially in networked technology. Twitter is another example: these days, it’s presented to new users as a way get information from organizations, brands and celebrities. When I signed up, I thought it was a lightweight way to stay in touch with people. But now, in my life, it serves a couple of distinct purposes. But the single biggest impact of Twitter on my life is why you and I are talking on the phone--it’s a networking connection, to meet the friends of our friends and expand outward in this circle of interesting pieces. Which goes back to the design decision of allowing you to see other people’s @ messages if you are also following that person. Probably, the people who made this design decision didn’t think about how it would make networks transparent. I sometimes describe Twitter as Douglas Adams’ Infinite Improbability Drive, only for my social life – you pass through all parts of the universe (or in this case, social network) at once. With networked tech, it is more likely that there will be this sort of emergent behavior. The etiquette about twitter, DM fails, all of these things emerge. Even the simplest technologies have alternate uses, like using a butter knife as a screwdriver. Like the Game of Life, you can predict certain behaviors but it is not entirely deterministic--there are complicated and interesting emergent behaviours. “Evolving network nodes of culturally-inscribed divergent use-value” might be a fairly tidy way to sum up how the Future-Present solidifies into easily understood pieces. But this doesn’t mean that we have them completely under our thumb. Drones serve as an archetype for this aspect of the Future-Present not only because of their conglomerate conceptualization, but because, at the end of the day, we don’t control them. They fly overhead, always recording our actions, whether we like it or not. Many are armed with nothing more deadly than a camera, and still, that is more than enough. We may be able to control them remotely, and occasionally hack them to broaden their use. But like the angels of heaven, invoking their name is an attempt to wield their power, as much as it is an admission that whatever they are, they are always just outside of our sphere.